The AA operate a service called AA Fuel Assist. No it is not free to members of any level, however a small discount is usually given for existing AA members. Fuel assist jobs are handled by a separate unit within the AA separate from the main breakdown call center, AA fuel assist sources its work predominantly from fuel related breakdowns that come through the main breakdown unit (hence the reason the first question you are asked when calling the AA after you get the the safety spiel is “when did you last fill the car with fuel”), the AA also actively solicits work with its fuel techs leaving calling cards in petrol stations. As you might suspect they do mobile fuel drains for members and non members alike. The cost varies and I have heard prices ranging from £160 to £240, there does seem to be some discretion on the pricing policy depending on the workload they have on any given day. Of course technically the AA are very good at what they do and their technicians really do know which end of a spanner to hold, I would have no hesitation recommending them. However, being in competition with the AA I cannot end this article without a “but”. But – the AA has a work flow system, the average AA fuel drain tech will do more fuel drains in an 8 hour shift than anyone else, they can do this by route planning and using clever GPS technology to calculate the most efficient and time effective route’s between jobs, good for the AA, not so good for someone who needs a fuel drain in a hurry. 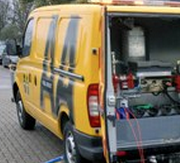 Since the AA only has 80 odd fuel draining vans and a few thousand breakdown vans It is not uncommon for the AA to attend a misfuel with a normal recovery van vehicle instead of a fuel draining van, and tow you back home, the next day your car will get drained by another unit at a time that suits the route computer.